If you are anything like me, then once you have found your sweet spot you are out like a light. I’m lying on the Evelyn Chaise Lounge Chair getting all comfortable and before I know it I’m fast asleep. This chair is perfect for those lazy Sundays or relaxing evenings. It’s happened to all of us at some point I’m sure, but have you ever fallen asleep on the sofa and gotten so comfortable that you don’t want to get up? This is what happens sometimes when I use the Evelyn Chaise Lounge Chair. So what exactly are chaise lounge chairs? A chaise lounge chair is the French expression for an extended chair. In recent times, the chaise lounge chairs have become a classic staple in modern homes today. When placed right in the home, it can compliment your decor with class and style. These chairs can be a great addition to any living room, private room, or in your bedroom. The Evelyn Chaise Lounge Chair can act as a bed for unexpected guests, a place to read a book, chill out, and even used as a place to cuddle up with loved ones. If your space is big enough sometimes these are put alongside or next to the sofa facing the TV. If you have a window with a spectacular view then placing the lounge chair facing it wouldn’t be a bad idea. This would give you those romantic scenes that you crave for cuddling up with someone you love. For those of you that like to read, you could decide to get a floor lamp to hang over the Evelyn Chaise Lounge Chair to give you that extra reading light when day starts to turn to night. So you’ve decided you want the lounge chair but wondering what colours the chair is available in. Come down to one of our showrooms and one of our helpful staff can show you all the possible vibrant colours that this Evelyn Chaise Lounge Chair is dressed in. 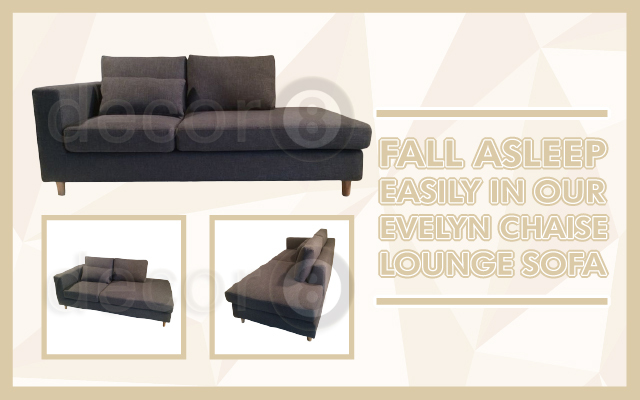 This entry was posted in Chaise Lounges and Daybeds, Lounge Chairs, Seating, Sofas and tagged bedroom, chaise lounge, comfort, decor8 chaise lounge, enjoy, layback, living room, lounge chairs hong kong, modern design sofa, modern sofa, multi funtional, relaxing.